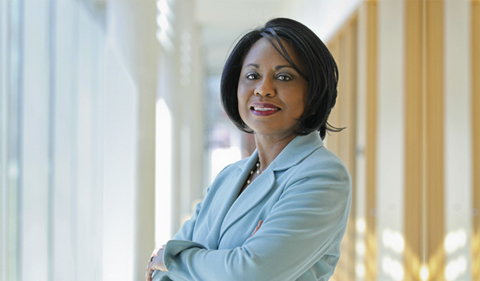 Anita Hill, J.D. will deliver “From Social Movement to Social Impact: Putting an End to Sexual Harassment in the Workplace” on Monday, April 1, at 7:30 p.m. in Templeton-Blackburn Alumni Memorial Auditorium. Doors open at 6:30 p.m. This Kennedy Lecture is free and open to the public. Hill is University Professor of Social Policy, Law, and Women’s, Gender and Sexuality Studies at Brandeis University. She is a women’s rights icon and the chair of the Commission on Sexual Harassment and Advancing Equality in the Workplace, which the entertainment industry formed in response to the #MeToo movement. In 1991 at the Senate Judiciary confirmation hearing for Supreme Court Justice Clarence Thomas, Hill courageously testified that Justice Thomas had sexually harassed her. In the process she inspired a generation of activists to fight sexual harassment and the unequal treatment of women. Hill speaks about how to end sexual harassment by creating positive change within organizations. She offers powerful insight into how women can defend their rights to equal opportunity and help foster organizational cultures that uphold respect for women and human dignity. Hill’s latest book, “Reimagining Equality: Stories of Gender, Race and Finding Home” (Beacon Press, 2011) combines the study of commercial and anti-discrimination law with an examination of culture and society to address the 2008 foreclosure crisis and its ongoing impact. OHIO’s Kennedy Lecture Series was established in 1962 by a gift from OHIO alumni and stalwart supporters Edwin L. and Ruth Kennedy. The Kennedy Lecture Series aims to bring speakers who appeal to a broad cross-section of the OHIO community to the Athens Campus to discuss significant issues in American life. OHIO’s Frontiers in Science Lecture Series was established in 1991 by a gift from Jeanette Grasselli Brown, an OHIO alumna and former University trustee, and her husband, Glenn R. Brown. The series features scientists who have been recognized for their commitment to share their scientific knowledge with individuals of all ages. The Kennedy Lecture Series and Frontiers in Science Lecture Series are facilitated by Event Services and a Committee chaired by Judith Rhue. Press inquiries or other questions can be directed to Liz Pahl, pahl@ohio.edu or Judith Rhue, rhue@ohio.edu.